In a contemporary language, and containing the Apocrypha, this NRSV Bible is a sturdy and reliable addition to your Bible shelf. Though they are regularly used in both Protestant and Roman Catholic congregations, the books of the Apocrypha are difficult to find in affordable English Bibles today-until now! A spectrum of attractive colors - black, burgundy, blue, royal purple, dark green, and white - suit any occasion. NRSV Bible with Apocrypha: Black, Imitation Leather by Hendrickson was published by Hendrickson in December 2005 and is our 5870th best seller. 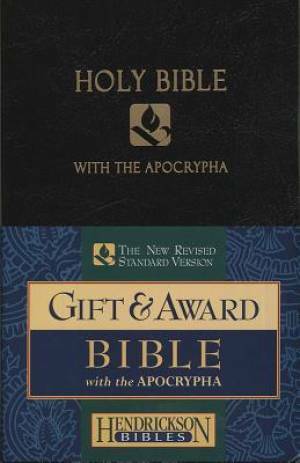 The ISBN for NRSV Bible with Apocrypha: Black, Imitation Leather is 9781565637092. Be the first to review NRSV Bible with Apocrypha: Black, Imitation Leather! Got a question? No problem! Just click here to ask us about NRSV Bible with Apocrypha: Black, Imitation Leather. A:This is an Americanised Bible, so expect lots of dropped 'U's and added 'Z's. Thank you for using the Q&A Forum.